Hundreds of creative decision-based defenses, dozens of artfully drafted and heavily supported motions, answers to 95% of the questions arising in day-to-day DUI practice, and authoritative interpretation of 1,700 cases. California Drunk Driving Law has long been referred to as “the bible of DUI defense,” and for good reason. This two-volume treatise remains indispensable for both newer attorneys seeking fundamental information about such things as charges, sentencing, and license suspension actions, and veteran attorneys looking for more detailed analysis on scientific issues, trial tips, and writs and appeals. Most attorneys do not realize how many solid DUI defenses exist, and so plead instead of fight their cases. The enormous complexity of California DUI law has created painful traps for the unwary, so wise guidance is essential. Creative defenses. Hundreds of decision-based arguments, generated by the authors in their decades of creative DUI practice and collected from successful DUI practitioners statewide, bring real leverage to your plea bargaining, trials, and DMV proceedings. Heavily supported motions. Crafted, tested, and polished by top DUI lawyers, these practice-proven documents will materially raise the level of your advocacy. 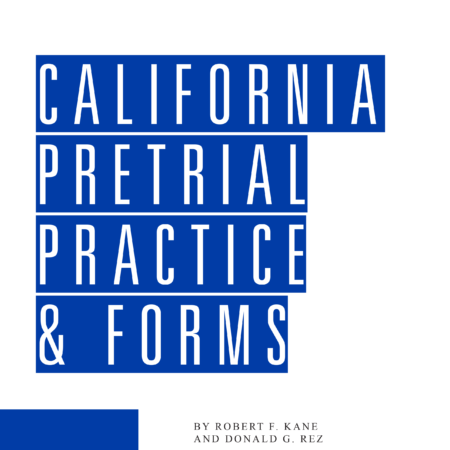 The book has over 120 forms that can be accessed digitally and modified to your case. Answers and solutions. 95% of the questions that arise in day-to-day DUI practice are addressed. References to other sources are provided for the other 5%. Authoritative interpretation of the law. Over 1,700 cases and every relevant statute and regulation are analyzed and cited. For answers to all your client’s questions (and yours), turn to California Drunk Driving Law. This invaluable book provides the most complete coverage of state DUI practice available. Your client calls because his driver’s license was taken at the time of arrest. The client refused a chemical test. Your client is worried about losing his job. The conviction occurred long ago, but now the DMV won’t issue a driver’s license. Your client is worried about the future cost of insurance if he is convicted. You want to assure your client of your knowledge and expertise. How to deal with threats to punish the defendant for insisting on a trial. How to remind the prosecution of the police’s potential civil liability for failure to turn over material evidence. Why you may not want to enter a general time waiver when setting trial for a defendant not in custody, but merely consent to a date certain. How to avoid half-day trials. How to counter a discovery denial based on copyright infringement. How to overcome Lively’s “could have been arrested for public intoxication” theory when the arrest is for attempted drunk driving. How to persuade a hospital not to disclose blood test results obtained during treatment, with model letter. Four techniques for defending against the breath-based per se charge. Suppressing Preliminary Alcohol Screening (P.A.S.) test results at trial. Impeaching a cop’s expert opinion on impairment by showing that the Federal NHTSA-recommended methods were not used. Proving a cop’s method of administering the Horizontal Gaze Nystagmus test is not generally accepted. How to block prosecution experts from testifying in low BAC cases that the defendant was mentally impaired even though he or she showed no signs of physical impairment. When to admit a prior conviction sentence enhancement allegation. How to circumvent the court’s lack of authority to grant a second offender work/DUI Program restricted license. Obtaining an ignition interlock restricted license prior to the end of the full suspension or revocation period. How to convince collection agencies to drop claims for emergency response costs. Many attorneys mistakenly think the DMV is requiring completion of a DUI Program prior to reinstatement of full driving privileges after a wet reckless conviction. How and when to assert jurisdictional speed trap defects. What to discover when airplanes or helicopters are used for speed enforcement. How to challenge radar-based speed trap violations of prima facie speed limits. How to block DMV hearing continuances without good cause, with 8-page motion. What to do when the DMV takes additional evidence in violation of Vehicle Code provisions. Why you should always discover form DS 393, and how to use it to block admission of police-drafted documents, with pattern discovery request. Paul Burglin (www.burglin.com) practices DUI defense in Marin, Napa, Sonoma, Lake Tahoe, and the San Francisco Bay Area. He serves as a Regent with the National College of DUI Defense (NCDD), and is Board Certified by NCDD (as recognized by the American Bar Association). Known and respected by prosecutors and judges alike, he has over 30 years of trial experience and holds an A-V rating with Martindale-Hubbell. He has multiple appellate published cases, is the Editor-in-Chief of the NCDD Journal and a graduate of U.C. Berkeley and Gonzaga University School of Law. Barry Simons (www.duilawyerorangecounty.com) is a nationally known expert in DUI defense. He has specialized in DUI defense in Orange County for over 30 years. Mr. Simons is one of the founding members of the National College of DUI Defense and is a former Dean of its Board of Regents. He is Board Certified in DUI defense, and has served as Vice-Chair of the DUI Advocacy Committee of the National Association of Criminal Defense Attorneys. He serves on the Board of Directors of the California DUI Lawyers Association (with Specialist Member status) and has been selected to Who’s Who In American Law. Mr. Simons has multiple appellate victories, including the Ninth Circuit’s Nelson v. Irvine, and he is a frequent lecturer at DUI seminars throughout the country.